You will need RealPlayer� G2 to view these clips. Download it here. 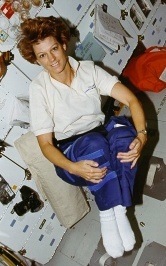 Reading the short biographical piece on Col. Eileen Collins that NASA sent me, I was impressed. For one thing, she collects college degrees the way I collect CDs. And these degrees are in pretty challenging subjects: mathematics, science, economics, operations research, and space systems management. She�s a trained pilot and a pilot trainer, and she also was an associate professor of mathematics. 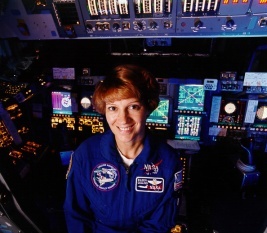 Then there�s the small matter of being the first woman to pilot, and then command, a NASA Space Shuttle. Here�s what she had to say about her career as a Federal employee so far. Question: What are your feelings about Federal employment overall? Answer: I have worked for the military or NASA for the last 21 years of my life. I have been given tremendous opportunities for jobs, for leadership, and for being on the leading edge of technology in what I�m doing day to day. I have had opportunities to travel, to work with people, and exciting challenging jobs. I wouldn�t change anything. I�ve enjoyed going to work every day. Question: What do you think is most important to Federal employees in their jobs? Answer: Making people really feel that they are a part of the overall mission and their job is important. I look at the people that actually do the hands-on work on the Shuttle at Kennedy Space Center. When they see an astronaut come in, they say, "Oh, come and look at my orbiter, come and look at my tires, my engine." And, they feel like they really are a part of that orbiter. This is the reason that the orbiter is flying so safely and so reliably. We have a very lean workforce at the Johnson and Kennedy Space Centers. One of the advantages of having such a lean workforce is that the few people who are responsible for a certain system are really responsible. Because of that, I have no problems at all flying the Shuttle and trusting my life to these people. I know a lot of them, and I know how dedicated they are to their jobs. That makes us feel good. Question: What helped you most in your career? Answer: The biggest help for me was just focusing and doing my current job at the time and having support from my immediate supervisor, which is something that the Air Force is focusing on. Immediate supervisors are really taking an active role in their subordinates� career directions, and I think that is working well in the Air Force. Question: What was the biggest hindrance to your career? Answer: Probably the biggest hindrance was the law preventing women from serving on combat aircraft and on combat ships. When I first graduated from pilot training, I wanted to fly fighters. That was in 1979. Because of the law against women in combat, however, the Air Force obviously wasn�t going to spend a lot of money training me to fly an airplane that I�d never be able to fly in combat. But, I knew that if I just did my job, and did it well, some day -- probably not for me � but, some day, the law would change. And, it did, in April of 1993. I remember how happy I was because, although it was too late for me, maybe I was part of getting this law lifted. Now, a woman can choose a job where she flies combat aircraft or goes on a combat ship. Question: Have you gone where you intended to go with your career? Is it something you chose and aimed for from an early age? Answer: I can�t give any specific moment when I decided what I wanted to do. When I was a child, there were no women astronauts and no women military pilots. But, as I grew up and started learning more, the space program started becoming more visible. My first memory was the Gemini program in the mid-1960s. Also, of course, the Vietnam War started in the late 1960s. 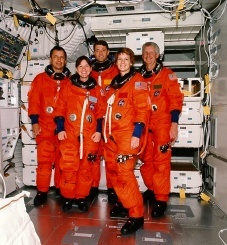 That was when I first started to become aware that there were astronauts and there were military pilots. When the Vietnam War was over, and I was older, I started reading about the Vietnam War, and the pilots really became my heroes. As I got older, I started wondering why we didn�t have women in these fields. 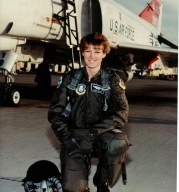 Then, in 1976, the Air Force selected the first women to be active duty pilots. I graduated from college in 1978, the year that NASA first selected women mission specialists for the Space Shuttle program. At that point, it became a realistic goal for me, so I applied. With a great desire to join the military, I decided to join, whether I got to fly airplanes or not. Question: What was the attraction of military service? Answer: Well there were lots of reasons. First of all, I thought that citizens have a duty, at some point, to serve their country. I liked the thought of what military life would be like. I like organized, structured, very goal-oriented types of jobs. I like working with people; I like working with a team. 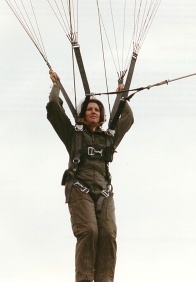 As the barriers started falling for women, and for women pilots, I realized that I could join the military and become a pilot. So, I applied and was fortunate enough to get in. Soon, I started thinking about the astronaut program. Question: Is it extremely competitive to become an astronaut? Answer: Well, yes, it is. To be selected, you need an undergraduate college degree, although you are not competitive unless you have a Masters degree or a doctorate. You need three years of related experience in your field. Your field and your degree need to be in technical areas such as math, science, engineering, or medicine. There are also physical requirements. We have interviews every two years. I would say we have almost 3,000 qualified applicants each time. And, I think we�d have more if more people knew about it. From the candidates who apply, we interview about 100. Picking the best qualified is a tough job. We could probably hire everyone that comes down here to interview because they usually exceed the requirements. Ultimately, about 20 to 30 of the applicants actually become astronauts. Question: What happens after a new astronaut comes on-board? I imagine there�s an ongoing learning experience, right? Answer: Oh, yes. All new astronauts go through class together for about a year. Then, you become an astronaut. But, all those astronauts can�t be assigned to a flight at the same time, so everyone gets a support job somewhere within the space program. It can take anywhere between one to six years to get assigned to your first flight. It was more than four years before I flew my first flight. But, when I flew my first flight, I was ready to go because those jobs were really a continuation of my training. We also do flight- readiness training with the T-38 aircraft while we�re doing our other jobs. It�s a very important, inexpensive way to keep up the astronauts� flight proficiency. Question: Isn�t there a reinvention story around the T-38�s? Answer: Yes; that�s a good point. The T-38 aircraft is a two-seat jet trainer that�s been around since the late 1950s, and it�s just an excellent, easily maintained aircraft, exactly what we need for training. We can also keep our costs down with this airplane because it�s used by the Air Force as well as NASA, and we have common supply sources and maintenance procedures. What�s happening now is that the airplane is old, so it�s getting very expensive to buy parts. Instead of going to a whole new aircraft, we upgraded our T-38s so they could use new technology. Now, it�s a much safer airplane, as well as much easier to maintain. Question: You mentioned that there�s a similar process with the Space Shuttle. What�s happening there? Answer: Right. Shuttle upgrades are going on all the time. We are always looking for ways we can fly the Space Shuttle safer, better, and at a lower cost. We are always trying to keep our costs down, especially in the Shuttle program, because that frees up more money for other options in the space program. This goes all the way down to the people at my level. Astronauts who use the hardware every day think about how we can do things better and how we can be more efficient. We could go build an entirely new space vehicle. That�s been proposed. But, you�ve got to weigh the costs, the risks, and the amount of time in building a whole new Space Shuttle versus taking the Space Shuttles that are proven and very reliable and just upgrading and making them better. In fact, I�m writing my post-flight crew report right now for my mission that flew last month. We�re making specific recommendations on what we can do to make the Shuttle safer and better, and all those recommendations will be considered by our management. So, communication is very good. Question: Do astronauts and other Federal employees work closely together? Answer: We do. It really is so important that the people who eventually are going to fly on the Space Station are in there working with the engineers and the flight controllers who are designing the systems, developing them, and building them. It gives us the opportunity, from a user point of view, to suggest changes to the design up front so that when we get the Space Station up there, we don�t have to change it later. I just came back from a mission, and I got really familiar with all the people that built the telescope that we put in space. 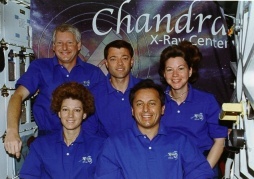 We were like a family, and now we�ve got this telescope up in space. And, it�s doing great. Question: Do you have any advice to give to the next generation of potential astronauts? Answer: My advice to young people is this. Focus on three major areas: academics, activities, and your physical health. I encourage you, especially when you get into high school and you can choose some of the courses you take, to take the tough courses. Don�t just avoid a course because you think you might not get an "A." Take the tough courses like math, science, and engineering. Learn a variety of things while you have the opportunity. I also encourage young people to join in community activities, church activities, and sporting activities. It really helps teach leadership, teamwork, and communication. Finally, I encourage young people to eat right, sleep right, and stay away from drugs and alcohol, especially if you want to be an astronaut some day. We don�t have any room for people who get involved in things that are illegal, and we want people in tiptop physical shape when they come to NASA. Question: Do you have any thoughts you�d like to share about your future? Answer: I�m a person who likes to learn a lot of things. Maybe I�ll go back to school again some day. For more information about NASA�s astronaut program, visit NASA�s Internet site.